There’s no need for you to loan a huge amount of money from the bank to start your own business. In fact, you can save a portion from your monthly salary to put up a small business that will bring considerable profit. So instead of splurging your salary on “YOLO” trips, start a promising business venture. 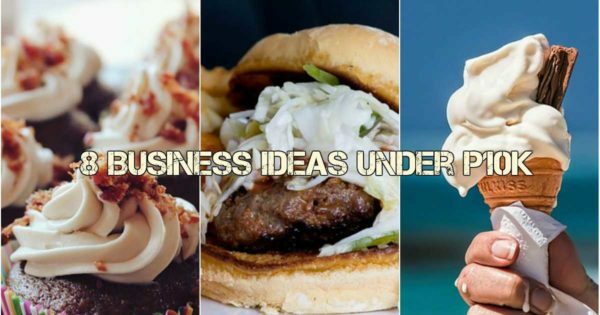 Here are a few business ideas which you can start under P10,000. According to Entrepreneur PH, you only need to allocate P8,000 to P10,000 to purchase initial stock of ice cream products and freezer. You can also get reasonable startup packages from ice cream companies to launch your very own ice cream business at home. You’ll be needing around P4,000 to P 5,000 for your food cart, about P2,000 to P2,500 for your initial stock of ingredients, and approximately P4,000 for your kitchen utensils or equipment. With a P10,000 initial capital, you can either put up a siomai cart or a burger stand in front of your house. Cakes and baked sweets are a must-have for almost any occasion. If you have talent in baking, make use of this skill to put up a pastry business. For this type of venture, you’ll need to invest around P3,500 for the electric oven, P2,500 for baking equipment, another P2,500 for initial ingredients and P850 for mixer. But most likely, you already have the necessary equipment and materials if you’re a seasoned baker so you’ll be spending less on your initial capital. Are you a make-up junkie who is capable of doing wonders on other people’s faces? Nowadays, make-up artists are in demand for events like wedding, debut, birthday parties as well as prenuptial pictorials. You’ll just need to invest on good quality make-up that can roughly cost you less than P10,000 if you already have the basic tools. Aside from selling cellphone load, you can facilitate domestic remittance or padala as well as bills payment with an initial capital of P10,000 or less and just a cellular phone. You don’t need to pay additional fees like franchise, application, annual and processing to offer these services. Got the knack for selling? Social media has made it easier for entrepreneurs to run a buy and sell business ranging from gadgets, supplements, cosmetics, apparel, and even appliances. Your initial inventory will cost you around P10,000. The millennial market is going gaga for anything hand-made. From DIY soaps, perfume, insect-repellent, candles, and even hand sanitizers, these hand-made products can be made from scratch. Simply get instructions from the Internet and purchase materials which will cost you P5,000 or less depending on the amount and you’re good to go! Most party stylists require downpayment amounting to the total cost of the materials they will be needing so your initial investment shouldn’t be a problem. To attract customers, create a portfolio using the photos of a party you styled for free and share it online.